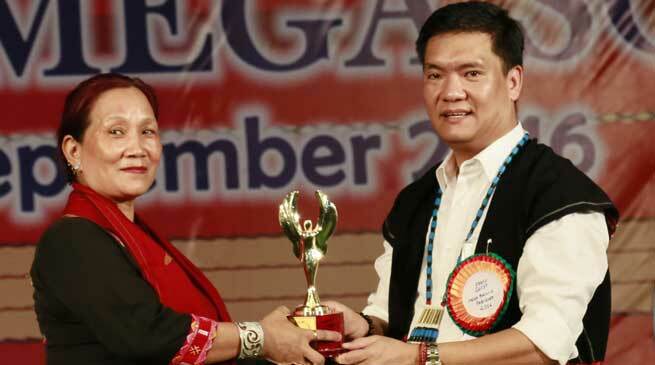 Chief Minister Pema Khandu addressing as a chief guest on the concluding evening of Mega Solung celebration, appreciated the role of women in cultural preservation of Adi society.He particularly appreciated the role played by the women wing of Adi Baane Kebang (ABK-WW) and its parent organization ABK for preservation and promotion of indigenous culture and tradition. The Chief Minister said the organizing of mega festival event is a right direction towards preserving ancestral tradition and called upon the younger generation to take keen interest in such festivals. He expressed concern over lack of enthusiasm among the educated youths in cultural preservation, which he feared would eventually erode our cultural roots. He said many educated youths today do not speak in their mother tongue and were unaware of their own cultural traditions. Emphasizing on the concept of “team Arunachal”, the Chief Minister expressed that working together is the only way to fulfill development aspirations of all and urged the people to take step towards the path of growth, progress and sustainable development. While stating that the state need to harness the vast potentials in various sectors viz agriculture, horticulture, hydropower, tourism, he said expert advice will be roped in for boosting these sectors. In this direction Arunachal Pradesh Investment Advisory Council will be constituted soon, he informed. Such steps are necessary as government sector alone cannot provide jobs to educated youths who are graduating in more numbers every year, he opined. Informing the state government will come up with long term policy for sustainable development; the CM said that government will support self-sustainable initiatives towards generating employment opportunities for the youths of the state. The Chief Minister also assured that no development will be forced upon people. Any decision taken will be in full confidence of the people, he said. The Chief Minister hoped that with air connectivity to facilitate landing of passenger flights to the centurion town, it will promote Pasighat as tourism hub including attract private investments and business opportunities. Further to accelerate growth of Pasighat town, the Chief Minister promised to sanction for a new market complex, which he termed as his ‘Solung gift’ for the people. Guest of Honour MLA Tamiyo Taga also called for preservation of the rich cultural heritage particularly the Abangs of Adis. He expressed hope that Giidi Notko will be turned into cultural center. On the occasion many were felicitated for their contributions in the field of cultural development and other areas.